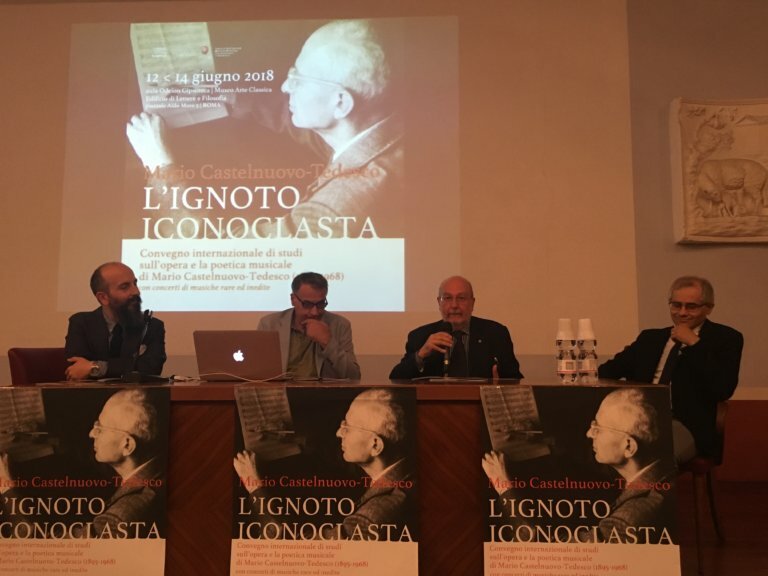 An international conference about the works and musical poetry of Mario Castelnuovo-Tedesco takes place at Sapienza University in Rome from Tuesday, 12 June – Thursday 14 June, 2018. The gathering will include academic presentations, roundtables, and concerts of rarely performed vocal music. Leading scholars including Fiamma Nicolodi, Mila de Santis, Antonio Rostagno, and Franco Piperno will participate. Vocal chamber music of Castelnuovo-Tedesco will be performed in several concerts, including the composer’s settings of American poetry by Whitman, St. Vincent Millay and Guiterman. Among the topics to be covered is the relationship between Castelnuovo-Tedesco and Neoclassicism, his American musical journey, as well as a round table discussion focused on the composer’s legacy, with particular attention to his compositions for guitar. The conference is a project of Assonanze, Associazione di Giovani Musicologi (Young Musicologists Association) of Sapienza University, Rome, supported by the School of Musicology at the Greek-Latin, Italian, Musical and Performing Arts Department, and by the Doctoral School of History and Analysis of Musical Cultures of Sapienza University, Rome in creative collaboration with ICAMus (The International Center for American Music), with the support of Oberlin College & Conservatory, The University of Michigan School of Music, Theatre and Dance, Jean & Samuel Frankel Center for Judaic Studies at the University of Michigan, and of the Castelnuovo-Tedesco Family. Info: info@assonanze.it | info@icamus.org.